The preceding chapters covered the concepts of database storage using the SQLite database. In these chapters the assumption was made that the iOS application code would directly manipulate the database using SQLite C API calls to construct and execute SQL statements. Whilst this is a perfectly good approach for working with SQLite in many cases, it does require knowledge of SQL and can lead to some complexity in terms of writing code and maintaining the database structure. This complexity is further compounded by the non-object-oriented nature of the SQLite C API functions. In recognition of these shortcomings, Apple introduced the Core Data Framework. Core Data is essentially a framework that places a wrapper around the SQLite database (and other storage environments) enabling the developer to work with data in terms of Objective-C objects without requiring any knowledge of the underlying database technology. We will begin this chapter by defining some of the concepts that comprise the Core Data model before providing an overview of the steps involved in working with this framework. Once these topics have been covered, the next chapter will work through an An iOS 7 Core Data Tutorial. Core Data consists of a number of framework objects that integrate to provide the data storage functionality. This stack can be visually represented as illustrated in Figure 41-1. As we can see from Figure 41 1, the iOS based application sits on top of the stack and interacts with the managed data objects handled by the managed object context. Of particular significance in this diagram is the fact that although the lower levels in the stack perform a considerable amount of the work involved in providing Core Data functionality, the application code does not interact with them directly. Before moving on to the more practical areas of working with Core Data it is important to spend some time explaining the elements that comprise the Core Data stack in a little more detail. 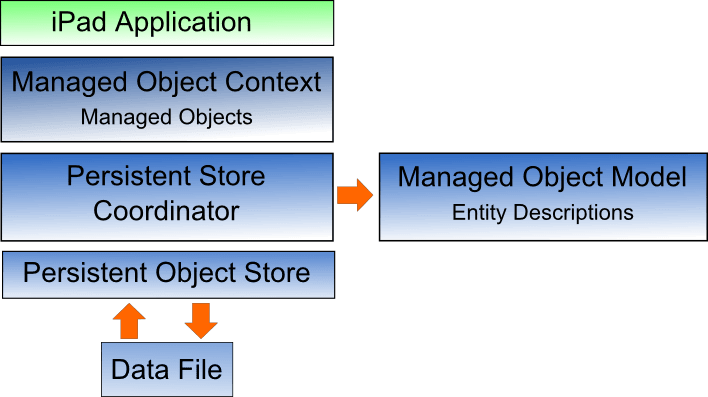 Managed objects are the objects that are created by your application code to store data. A managed object may be thought of as a row or a record in a relational database table. For each new record to be added, a new managed object must be created to store the data. Similarly, retrieved data will be returned in the form of managed objects, one for each record matching the defined retrieval criteria. Managed objects are actually instances of the NSManagedObject class, or a subclass thereof. These objects are contained and maintained by the managed object context. Core Data based applications never interact directly with the persistent store. Instead, the application code interacts with the managed objects contained in the managed object context layer of the Core Data stack. The context maintains the status of the objects in relation to the underlying data store and manages the relationships between managed objects defined by the managed object model. All interactions with the underlying database are held temporarily within the context until the context is instructed to save the changes, at which point the changes are passed down through the Core Data stack and written to the persistent store. So far we have focused on the management of data objects but have not yet looked at how the data models are defined. This is the task of the Managed Object Model which defines a concept referred to as entities. Much as a class description defines a blueprint for an object instance, entities define the data model for managed objects. In essence, an entity is analogous to the schema that defines a table in a relational database. As such, each entity has a set of attributes associated with it that define the data to be stored in managed objects derived from that entity. For example, a Contacts entity might contain name, address and phone number attributes. Relationships – In the context of Core Data, relationships are the same as those in other relational database systems in that they refer to how one data object relates to another. Core Data relationships can be one-to-one, one-to-many or many-to-many. Fetched property – This provides an alternative to defining relationships. Fetched properties allow properties of one data object to be accessed from another data object as though a relationship had been defined between those entities. Fetched properties lack the flexibility of relationships and are referred to by Apple’s Core Data documentation as “weak, one way relationships” best suited to “loosely coupled relationships”. Fetch request – A predefined query that can be referenced to retrieve data objects based on defined predicates. For example, a fetch request can be configured into an entity to retrieve all contact objects where the name field matches “John Smith”. The persistent store coordinator is responsible for coordinating access to multiple persistent object stores. As an iOS developer you will never directly interact with the persistence store coordinator and, in fact, will very rarely need to develop an application that requires more than one persistent object store. When multiple stores are required, the coordinator presents these stores to the upper layers of the Core Data stack as a single store. The term persistent object store refers to the underlying storage environment in which data are stored when using Core Data. Core Data supports three disk-based and one memory-based persistent store. Disk based options consist of SQLite, XML and binary. By default, the iOS SDK will use SQLite as the persistent store. In practice, the type of store being used is transparent to you as the developer. Regardless of your choice of persistent store, your code will make the same calls to the same Core Data APIs to manage the data objects required by your application. Create a new entity by clicking on the Add Entity button located in the bottom panel. The new entity will appear as a text box in the Entities list. By default this will be named Entity. Double click on this name to change it. To add attributes to the entity, click on the Add Attribute button located in the bottom panel, or use the + button located beneath the Attributes section. In the Attributes panel, name the attribute and specify the type and any other options that are required. Repeat the above steps to add more attributes and additional entities. As demonstrated, Xcode makes the process of entity description creation fairly straightforward. Whilst a detailed overview of the process is beyond the scope of this book there are many other resources available that are dedicated to the subject. The above line of code extracts the current value for the name attribute of the newContact managed object and assigns it to a string object. The Core Data framework stack provides a flexible alternative to directly managing data using SQLite or other data storage mechanisms. By providing an object oriented abstraction layer on top of the data the task of managing data storage is made significantly easier for the iOS application developer. Now that the basics of Core Data have been covered the next chapter entitled An iOS 7 Core Data Tutorial will work through the creation of an example application.